First and sustained catch Wyoming County : Spotted Wing Drosophila Latest information from the NYS IPM Program. Latest information from the NYS IPM Program. First catch in a raspberry planting on July 6, 2017 of 3 female SWD in a trap within the crop and 1 female in a trap set on the edge of the crop. 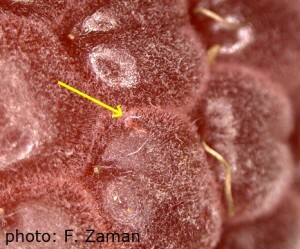 An egg is nestled under the skin of this raspberry, as shown by the white breathing tube (yellow arrow) on the fruit’s surface. The image is highly magnified to see the tiny structure. Sustained catch on July 12, 2017 of 18 SWD, 8 females and 10 males. Within the crop the trap caught 7 male and 4 female SWD. On the edge of the crop the trap caught 3 male and 4 female SWD. These traps are being monitored by Don Gasiewicz, extension educator, Wyoming County Cornell Cooperative Extension.